Creepy animated Walking Dead inspired character gives a big bang for your buck! He has moving mouth with spooky groaning Zombie noises and ferocious snarls! He also has scary LED light-up eyes! 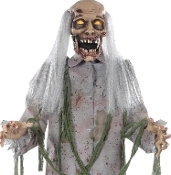 Tattered shirt and pants are included for a disturbing realistic effect in your horror haunted house cemetery or graveyard scene setting. Easy-to-assemble plastic frame has 2 water tanks at the base to fill for added stability. Requires *3-AA batteries (*YES, included). Infra-red motion sensor activated. Comes in a full color window box with a Try Me function. *Recommended for indoor or sheltered outdoor use.